Ip Man's passport. Notice spelling of his name - "Ip" not "Yip". Some mistakenly believe Ip Man founded Wing Chun. This is not true. In reality, Ip Man’s style is one of a number of Wing Chun lineages. But a couple of facts make him and his Kung Fu family renown. His line of Wing Chun is practiced widely today, especially in the Americas, Europe, and Australia, because many of his students emigrated from Hong Kong and took an entrepreneurial passion with them to teach and spread the knowledge worldwide. There's at least five generations of Ip Man students today. I'm a 4th/5th generation practitioner. I've had two Wing Chun sifus. My first one, a 3rd generation student and my current one a 4th generation student. Many of his "grand" and "great-grand" students have also adopted the entrepreneurial spirit and spreading the art even further, both offline and online. Ip Man’s Wing Chun, or is it Yip Man? Yip Man is an alternative spelling of Ip’s name. 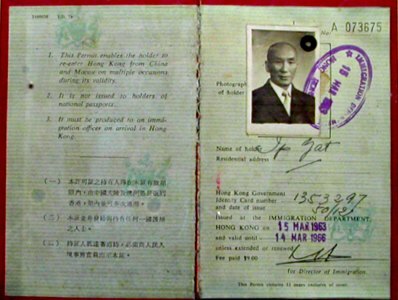 By looking at images of Ip Man’s passport (shown above), it is spelled “Ip” not “Yip”. You won’t be frowned upon for using “Yip”, many people do. Ip Man was born Ip Kai Man on October 1, 1893 to a wealthy family in Foshan, China. He was the third of four children. Depending on the source, he began studying Wing Chun under Master Chan Wah Shun either at age of 9 or 13. Master Chan was already very advanced in age at this time and its widely accepted that Ip was Chan Wah Shun's last student. Legend says that Master Chan was one of the Ip family's body guards. He didn't want to take on any new students and wasn't interested in teaching Ip. So young Ip got 300 pieces of silver (that's a lot of money even today!) of his own money, which at the time was enough to buy a house, and offered it to Master to teach him. After Chan learned the silver was indeed Ip Man's, and not stolen, he realized how serious the boy was about learning Wing Chun. Master Chan waived the fee and taught him. Ip studied between two and four years under Chan (before Master passed away) and under his advanced students, such as Ng Chung-sok, after Master's death for an additional couple of years before moving to Hong Kong to study. Silver Money Trivia: In the Ip Man movie - The Grandmaster they say he only paid Master Chan Wah Shun 20 silver dollars. So is it 20 silver dollars or 300 silver pieces, and how much money is that anyways? First, let's assume 300 pieces of silver is a lot of money, even today. But how about 20 ounces of silver? The official definition of a dollar is one-ounce of pure silver. The word dollar is derived from Thaler, which was shortened from Joachimsthaler, which was the money (one ounce of pure silver) minted in Joachimsthal, Bohemia during the Middle Ages. The Joachimsthal's coin was respected because of its purity. The Thaler, in one form or another was minted and used throughout Europe for over 400 years. The last ones were minted in Saxony around 1872, and the last circulating Thalers were demonetized by Germany in 1908. During the Roman Empire times, a soldier was paid one-tenth ounce of silver for one day's labor. In an empire, soldiers are held in high regard, so we can assume one-tenth ounce of silver was a decent wage and enough to provide. Doing some simple math... ten days would earn a soldier one full ounce of silver, and a month of labor brought in about three ounces of silver to live on. Since there really wasn't any significant inflation in the world until all countries turned to currency backed by paper (opposed to hard and valuable commodities like silver and gold) around the 1970s, even if Ip Man only paid 20 silver dollars... that would be about 7 months income for a typical worker! What's 7 months of full-time income to you? That's the minimum Ip Man paid to learn Wing Chun. When he was about 15 years old, his family sent him to study in Hong Kong at St. Stephen's College. Along with academic studies, he spent a lot of time fighting... and winning. In one story, while in Hong Kong Ip Man was introduced to an older gentleman who told Ip that his kung fu was lacking. Ip Man challenged the older gentleman and lost. He found out the man was Leung Bik – son of Chan Wah Shun’s own teacher, Master Leung Jan.
Ip Man immediately studied under Lueng Bik for at least two and half years before returning home to Foshan after finishing his studies. Yip Man found the man living on a fishing boat anchored near the typhoon breakers in Hong Kong Bay. "Hey, old man!" yelled Yip. Yip Man picked up a stone and threw it in the man's direction. "Hey, old man!" he yelled once more. "What do you want, youngster?" "I've heard that you are a great kung fu master and I've come here to find out. I'd like to spar with you." "Old man," Yip said again, "I'd like to spar with you." The man stood silent. He stared into Yip's eyes, then moved his gaze up and down the boy's length. "I don't know, youngster," he said at last, stroking his chin. "You look pretty puny. I might be wasting my time. I'll have to see you do a form first." This request irritated Yip Man. "All right, old man," he said, dropping into a pigeon-toed horse stance. "Watch!" Yip performed the entire Shil Lim Tao form of Wing Chun, with its long isotonic motions which always seemed punctuated by a sudden combative pop. The old man smiled. "Okay, youngster. Come on board. We'll spar." No sooner had the two squared off than Yip Man raced after the old man in a blaze of punches. The old man met Yip's attack, stepped to the side, then ... SPLASSSHHH! The old man looked down at Yip in the waters of Hong Kong Bay. "What's the matter, youngster?" he said. "I thought you wanted to spar!" Yip climbed out of the bay, onto the dock, and back onto the boat. "Don't worry, old man," he said. "I'll show you sparring! ": He launched after the old man, a jet on takeoff. A few techniques were exchanged at a furious pace, then ... SPLASSSHHH! "Hey, youngster! Do you want to spar or do you really want to swim?" After his studies, Ip Man returned home to Foshan, got married, had children, and ran the wildly successful family business. His life was great - plenty of money and plenty of time for Kung Fu. But Chinese history was roiling in the background and taking many sharp turns which would consume his life. In the movie The Grandmasters, Ip Man's character, played by Tony Leung says (loosely translated), "If you describe your life as the four seasons, my first 40 years were spring, the rest were winter." Meaning it went straight to hell. Problems were brewing throughout China during his life's springtime, and this most likely helped edge his life straight into the dark winter. 1900 - Ip Man would have been about 7 years old during the Boxer Rebellion. 1912 - About this time he moves to Hong Kong to study. And all around him this took place: the fall of the Qing Dynasty and rise of the Republic of China and Kuomintang (KMT) led by President Sun Yat Sen, China's first elected government. 1915 - Things were dicey for the young KMT government. It's second president Yuan Shikai turned into an autocrat, tried to dissolve the young government, and place himself as the "new" Chinese emperor. 1916 - This turmoil led to China's Warlord era. During the turmoil many power vacuums opened across the county in which numerous military leaders sought to fill and claim as their own private dominion. 1921 - The Communist Party of China gets founded as a populist response to the mess China has been stuck in over the previous decades. 1927 - The KMT and Communist realize they don't see eye-to-eye and throw the country into a Chinese Civil War. 1931 - Imperialist Japan invades China, first taking over Manchuria in the north. 1934 - The Civil War still rages while the Communists go on the Long March. 1937 - The KMT and Communist, still stuck in bloody war, decide to stop killing each other - for a little bit - and join forces to kick out the foreign invaders - the Japanese. 1941 - The Japanese invade and occupy Hong Kong just days after bombing Pearl Harbor in the U.S. (Hawaii). 1945 - Japan gets nuked by the U.S. effectively ending World War II, and retreats from China. 1946 - The KMT and Communist pick up where they left off in their civil war and continue killing each other while further ravaging an already war torn country. 1949 - The Civil War ends, the People's Republic of China (Communist) gets founded. The KMT escapes across the ocean to Taiwan to set up a new capital on the island nation, The Republic of China. Officially today, China claims Taiwan as one its provinces, while Taiwan claims it's an independent country separate from China. They still have issues. Around 1949, with the Communist taking over the country and the KMT gone, Ip Man escapes the mainland and emigrates to Hong Kong with hundreds of thousands of other Chinese refugees escaping the misery and hoping for greener pastures. Grandmaster is impoverished and destitute by the time he reaches Hong Kong. He starts his life over from scratch at 56 years of age. Ip Man believed that Wing Chun was more than just a form of martial arts. He wrote a code of conduct for the students. It was to be a way of life. What's significant is Ip Man was one of the first to teach Wing Chun (or any martial art) commercially to the public - for a fee. I guess you could say fighting and martial arts was a professional skill, not a hobby as is common today, nor as a practical way to defend oneself and family. Up to this time martial arts in China was taught within families, to a few hand selected and trusted students, and to professionals - warrior monks, soldiers, guards, etc. But not to the general public. They were pretty much left defenseless. Ip Man, mostly due to necessity, changed all of that. The ugliness that is China's modern history pushed Ip Man directly into the winter of his life, and in a way, we are lucky for his sacrifices. Without the practical need to survive financially he may never have opened schools or shared Wing Chun with such a broad array of students. Some of his students include today's Wing Chun masters, and some recently deceased: Leung Sheung, Lok Yiu, Leung Ting, Chu Shong-tin, Wong Shun Leung, William Cheung, Moy Yat, Hawkins Cheung, Bruce Lee, and his sons Ip Chin and Ip Chun. Ip Man died of throat cancer in Hong Kong on December 2, 1972. He was 79.